Heavy Rescue: Seats 5 w/ 4 SCBA seats. 75' Aerial is ready to serve. 2000 gpm, 460 poly tank, foam. Close to a million dollar truck if you ordered it today! 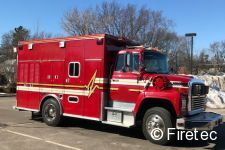 Very Good Rural Pumper - 1250/1000. Walk-Around Rescue - now at $19,500! 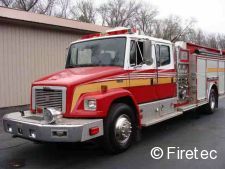 1500 gpm and 1000 poly tank on this excellent 1997 FL/ Pierce. Pierce Saber in Excellent Condition - 1500/1000 with foam! Partial Walk-In Rescue - great storage set-up and still seats 5. Excellent engine with 900 water. Asking $65,000 Or Best Offer! Very good condition & Current Pump Cert! 450 Horsepower Detroit Engine: Powerful! Recent in-frame overhaul and pump has been rebuilt. Very Clean & Reliable Truck for its age. 2003 Refurb on this walk-in rescue. Generator & Deck gun included in sale. 1000 tank - OAL only 26'3"!! 4x4 Brush PTO Pump & Roll!